Tea Party & Patriot groups, send in your links! Plus if you find a website that other patriots should know about send it in. Include a brief description and logo if you can and email it to links@ this domain. Your email will get posted here. I would like to thank you all for taking the time to contact your fellow organizers to get this great book out for free. I have been told that even when you contact your fellow leaders there is a since of skepticism or maybe just to busy to look into what this book is about. To assist in the process I have created this template that you can use. This will be very beneficial for the emails you send out. If you notice there is a link that allows you to watch one of the T.V. interviews with Brent. Brent does a great job not only explaining the book, but walking through the heart of the movement . If you insert the organizers name and your state promo code (this is GL plus the state abbreviation) at the bottom. I'm contacting you regarding the Peninsula Teenage Republicans. Do you have contact to other tea party and republican persons on the Peninsula, or would you be able to pass this email on to them? Robert Bruce Alexander suggested I contact you regarding the Peninsula Teenage Republicans. Do you have contact to the other tea party and republican party chair persons on the Peninsula, or would you be able to pass this email on to them? Peninsula Teenage Republicans meet every 1st monday of the month at the Pearson Toyota in their Community Room Upstairs. The purpose is to organize, mobilize, and train high school and middle school students conservative values, campaigning, and public service. I’d like to share an interview with you, this interview is from a recent show that was filmed and broadcast in Arizona. Click on the picture to start the video. There are two segments on the show. WHY DO I WANT YOU TO VIEW THIS? . I've started reading (& skimmed ahead) the copy sent to me and so far it looks great. Definitely an inspirational read for the war weary Tea Party patriot. 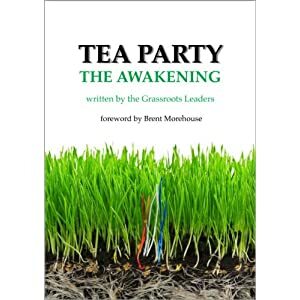 The forward (the first 72 pages) presents some unique and very reasoned explanations of the Tea Party movement.